I am about a month late again, but better late than never right? 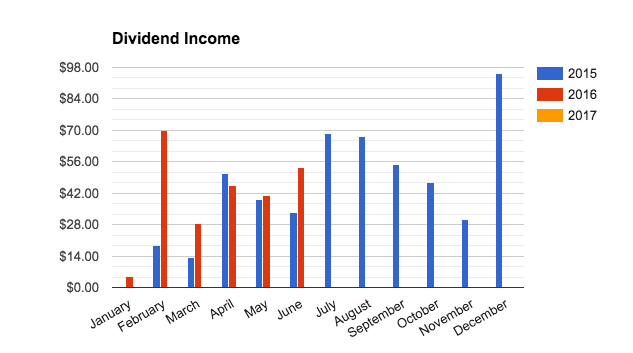 With SIX months down in 2015, I have collected $243.08 in dividend income! This month I received income from FOURTEEN different sources. Five more than May. 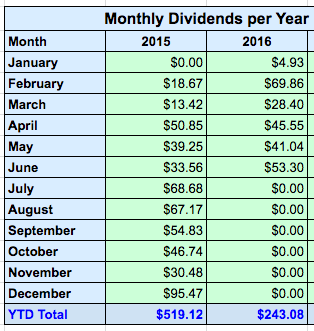 Compared to 2015 my dividends in June went up by 58.82% despite all of the changes I am making to my portfolio. Another big swing as I continue to make changes to my portfolio. It is a work in progress, but slowly getting there! Don't sweat! If you want - want to do a quick post again by Tuesday to drop your July income? Keep investing, keep being hungry and find every spare dollar you can to buy assets! Congrats, you're getting there. Thanks Lanny! Hope to be able to post it soon! Nice job. Don;t worry too much about the amount of dividends collected. 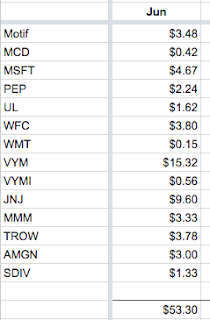 It's more important to get your portfolio where you want it. Dividend will follow. Thank you! Glad to hear that although it is taking longer than I thought. Trying very hard to be patient, may take longer than just this year. Keep it up Mogul. Slowly and Surely, you'll get there. Just stay consistent! With hardwork and commitment you're rock it for sure. I promise you. Let's keep pushing ourselves to greater and greater! Cheers bro. Better late than never. 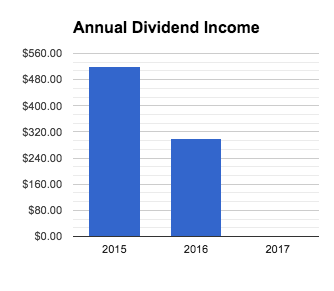 That's a solid showing for June and your total dividend income is really moving along just nicely. I see AMGN paying you last month. It's still on my watch list along with GILD. Thanks for sharing. Yup - I definetly would add to my position in the future too! GILD is also great as it keeps dropping and has a lot of cash on hand. All about that persistence Mogul. Keep rocking. It's the direction you're moving that's important! Thank you sir =) Nice to have another guy on the journey with me!